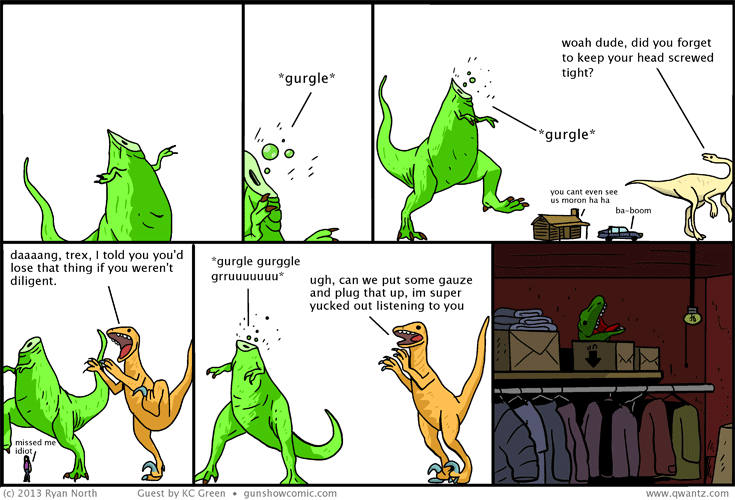 Dinosaur Comics - April 21st, 2014 - awesome fun times! whoah, what? awesome! it's a guest comic by kc green! April 21st, 2014: Hey everyone! Here is a special comic by your friend and mine KC Green! I had a surgery on Thursday (nothing major!) but I was not expecting it to, you know... hurt so much? Like I've spent maybe 6 hours out of bed total in the three days. Then I remembered late last year KC had sent me this comic with a mysterious note that said "you'll know when the time is right". Thanks KC! Everyone go read Gunshow, it is kinda ridiculously good? ?